Brief Synopsis: The Super Buddies encounter a fallen friend in Hell. 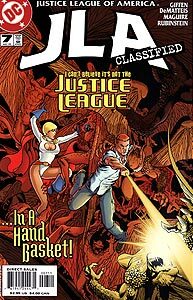 Issue Notes: Originally written and promoted in 2004 as the mini-series I Can't Believe It's Not the Justice League, this story was published in 2005 due to conflicting events occurring in the Identity Crisis mini-series. Events in this story must take place prior to Identity Crisis #1 for obvious reasons. Also, events of the Infinite Crisis mini-series have possibly erased some or all of the events in this issue from history. Blue Beetle II and Booster Gold discuss their situation, endlessly cooking and eating hamburgers in a fast food franchise in Hell. Booster has faith that an escape is possible. Previously, Booster's faith has been a matter of question. He has openly stated that he is an atheist (in Justice League International Annual #2), though that may have been a joke. Booster's faith is rewarded when he and Beetle and Elongated Man are rescued by Guy Gardner and Power Girl. Guy Gardner is wielding a yellow power ring. Though Sinestro's yellow Qwardian power ring was taken away from him by Hal Jordan when Jordan attacked Oa, it is possible that Gardner recovered his ring in the same manner that he transported Power Girl and himself to Hell to rescue the Super Buddies: he wished for it. Booster's comment suggests that his wife, Gladys, encourages him to wear a Wonder Woman costume in the bedroom. Booster had previously admitted to Maxwell Lord that Gladys encouraged him to wear his costume to bed, but this is the first hint that their role-playing may include cross-dressing. Power Girl is surprised by Booster's pep talk. Motivational speaking has long been one of Booster's most notable contributions to the Justice League, probably because of his team-oriented football past. As Elongated Man recovers from the trauma of Guy Gardner's "rescue," he mentions "the Maxwell." Maxwell Motor Company, Inc, an American automobile manufacturer, ceased production prior to the Great Depression. Boosterrific Review: Now that the creative team has clearly hit their full stride, I'm beginning to wonder if it is possible for them to turn in anything other than a perfect issue featuring the Super Buddies. Very funny but also very touching-I thought the scene with Fire and Guy crying may have ranked as one of the most touching scenes I have ever come across in comics.